The third largest lake in Utah (after the Great Salt Lake and Utah Lake) is found in the far northeast corner of the state - the 110 square mile, oval-shaped Bear Lake, stretching for 19 miles at the foot of the northern Wasatch Range, and draining northwards via a tributary of the Bear River. The lake spans the Utah-Idaho border, with half its area in each state, and is circled by paved roads that give easy access to much of the shoreline. The most unusual feature is the turquoise-blue color of the water, caused by suspended limestone particles eroded from the surrounding mountains; apart from this the scenery is pleasant though not so spectacular, as the lake is enclosed by low, uniform, grey hills, wooded near the summits and grassy below, and the shore is sandy or muddy without any cliffs or exposed rocks. 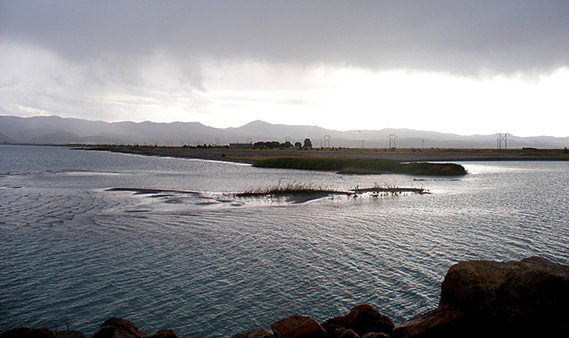 Bear Lake is a popular recreation center, for swimming, boating, fishing and camping, and the less-traveled east side in particular has many good access points leading to quiet campgrounds and day use areas. Some sections of the shore are part of Bear Lake State Park (actually two identically named parks, one in Utah, one in Idaho) and so charge a fee for entry, while other parts are free. The surroundings are generally quiet and agricultural (raspberries being the main crop) yet quite a lot of construction has occurred in recent years, especially along the lake's west shore, where many holiday homes have been built, and several resorts. The nearest town with hotels is Montpelier, Idaho, 15 miles from the north shore of the lake. The west side of Bear Lake is bordered by US 89 through St Charles and Fish Haven to Garden City, then UT 30 further south to Laketown at the south edge of the lake - these four towns, although small, provide all necessary visitor services. Most of the land is developed, and houses line much of the roadside except for a few publicly-accessible areas, which include Bear Lake State Park Marina just north of Garden City, a straight stretch of UT 30 in the southwest, and Rendezvous Beach in the south, also part of the state park. The majority of the shore is wide, grassy mud flats, not as nice as the narrower east side beaches. Although the west side highway (US 89 and UT 30) is busier and better quality, the east side road crosses emptier land with frequent lake access, and is a more scenic drive. The route is paved all the way, and signposted from both ends; it starts in the north at St Charles, heading due east across grassy marshland, part of Bear Lake National Wildlife Refuge that extends several miles northwards. The first lake access is at North Beach, one of the two units of the Idaho state park, where $5 is paid for day use parking. The beach is wide and flat, a mixture of sand and mud, with a few picnic tables along the shore and a short road/pier leading out towards the water, beside the lake's exit channel. The road then turns south through privately-owned land for several miles, past quite a few houses, many large and elegant, enjoying elevated views over the lake to the mountains beyond. Development stops at the edge of the East Beach section of the state park, a 2 mile long enclosure with a campground, picnic areas and nicer beaches, all extending as far as the Utah border, after which are various other campgrounds and boat launch sites as the road runs along the water's edge for ten miles, over uninhabited land. Some areas are part of the Utah state park and require a fee, but other places are free to enter, though here camping is not allowed; the nearest locations for free primitive camping are along several unpaved tracks leading eastwards into the hills. All beaches hereabouts are clean, rocky or sandy, and narrow since the land slopes down steeply, unlike the wide flats along the north, west and south edges - this is because the east edge of the lake covers an active fault zone, where the land is slowly subsiding, and the water is over 200 feet deep quite close to the shore. The lakeside remains undeveloped until the south end, where houses reappear and all the land is private, apart from the state park headquarters and campground at Rendezvous Beach, though this is quite far from the water and not very scenic.